To help understand the rights situation and of different groups in a community. In the example below the focus is on women's rights. However, the same exercise could be carried out focusing on the rights of children (girls and boys) or people living with a disability, for example. Organise a meeting with women’s group members or women in the village at a place commonly agreed by them. Explain the purpose of the exercise and why it is important to understand women’s condition and status in the community. Initiate a discussion using a brain storming exercise on the key components of women’s development and what they think about their situation. Make a list of the key components of women’s development that are linked to their rights, such as: high school education, participation in village affairs, leadership, decision making in village affairs, access to resources, employment opportunities, income from daily work, responsibility for household work, ownership of resources, feeling safe and secure from violence. Ask them to draw pictures representing these components on separate flash cards. Ask the women to place one flash card at the end of each line so that the line represents that particular component. Mark up a scale of 0 to 10 on each of the lines representing the different components, with “0” (lowest) at the centre and “10” (highest) at the outer end. For each component, ask the women to score on the scale of 0 to 10 with regard to the status of women in the village. Explain that the score is based on how they perceive the overall situation. Score all the components in the same manner. Mark the scores on the line. After completing the marking on all the lines, join the markings using one particular colour. Repeat the activity, focusing on the conditions and status of men. Join all the marks indicating the men’s status using a different colour so that the difference between the status of men and women is clearly seen on the diagram. No men should be present in the women’s group while doing this exercise as this might inhibit the women's responses. The exercise can be done separately with women and men and after each group completes their separate analysis, their cobwebs can be compared and discussed so that the perceptions of women and men can be shared. 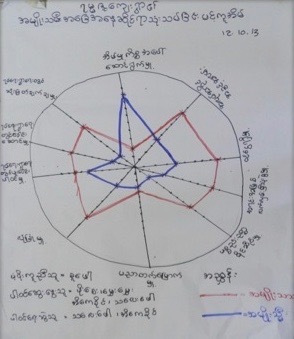 Village Book: Community led planning and development processes, Training Manual, ActionAid Myanmar, 2015.